Asha Grant came to Kerenza to escape her past. Too bad he just caught up with her. Asha survived BeiTech's initial assault and has been working undercover with the hopelessly outmatched resistance ever since. The last thing she expected to worry about was her ex-boyfriend, Rhys Lindstrom who just landed planetside. Is he her way out - or guarantee she never gets off this frozen rock alive? But Asha's not the only one with problems. Her cousin Kady's ragtag band of survivors are headed for Kerenza - without enough oxygen to last the journey. Oh, and there might be an insurrection brewing. With BeiTech hurrying to repair their damaged jump gate, and a mass extermination planned for the Kerenza civilians, only a miracle could save them now. And everyone knows that miracles are just statistical probabilities...right? BRIEFING NOTE: From bestselling author duo Amie Kaufman and Jay Kristoff - and select journal entries from Marie Lu - comes the heart-stopping, heartbreaking finale in the trilogy that broke the mould and has been called "stylistically mesmerizing" and "out-of-this-world awesome." After cutting his fantasy teeth in the worlds of role playing games, since 2012 Jay Kristoff has rapidly risen to become one of fantasy fiction’s preeminent talents. The author behind no less than four major fantasy and science fiction series, Kristoff burst on to the scene with his fusion of steampunk and feudal Japan in Stormdancer, quickly amassing both awards and a passionate audience. 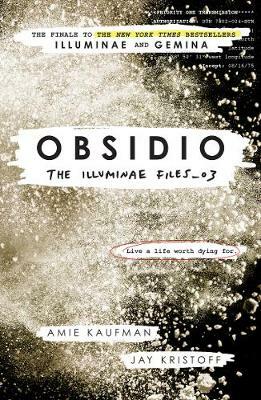 To be honest, Obsidio isn't my favourite of the Illuminae Files series, in large because I never really felt as close to our two new protagonists as I do to Kady, Ezra, Nik and Hanna.